As spring quickly approaches, I’m getting excited about more daylight hours and spending time outdoors. My favorite place at my home is the pergola space in my backyard. I love entertaining, chilling out in my backyard with friends, or just relaxing with a good book. I love the Terrace collection of outdoor rugs we make at Mohawk Home. 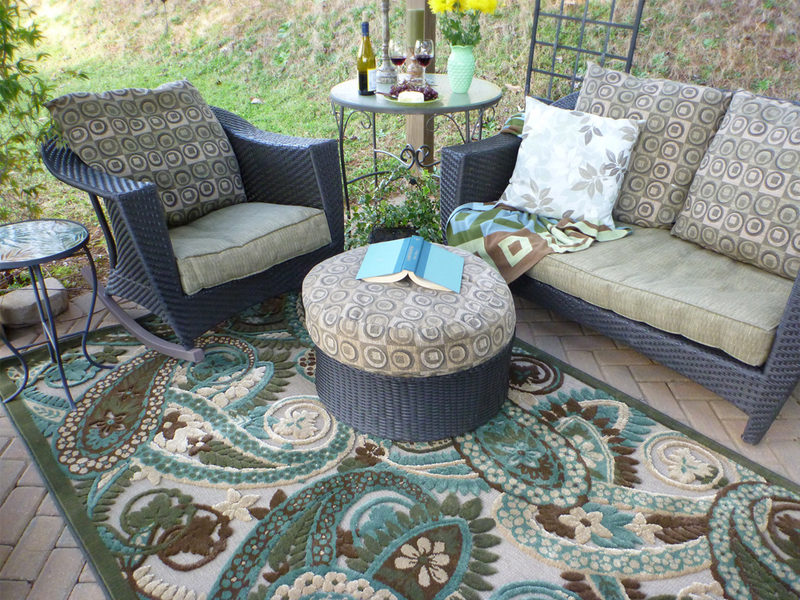 Adding a rug to an outdoor space makes it very comfortable and creates the coziness of an indoor living space. I love this collection of rugs because it combines the typical outdoor sisal-looking rug as a ground weave, but it also has a plush pile like an indoor rug that feels great under the feet. The over-scaled paisley feels modern and global and I like the fact that the color has some nice natural colors like beige, browns, and greens, but it has that pop of turquoise that makes it more fun for the outdoors. This pergola area is behind our swimming pool and the turquoise and naturals in the rug tie the naturals of the outdoors with the color of the swimming pool. I’ll be dragging a thousand pots out of storage and soon the area will come to life with lots of flowers and solar light. My wife is a wizard with all of that stuff. But it’s just a little too cold for that yet. Want to know where you can buy a fresh and fun Indoor/Outdoor Terrace Rug? Click Here. Ive been searching everywhere trying to find the same colored carpet in the picture. The colors are bright and clean. Could you please help. Elexis- This rug is made in the same colors as the item in the post. Do you like this rug? We are all waiting for the 4-1-1 on this rug. Not a look-a-like, the exact one. I’m sorry but since this post was written the rug has been discontinued in this coloration. We still sell Estancia Terrace rug but only in a black/charcoal color.